Milan Popovic, a post-doctoral fellow in Minsoo Kim's Lab, was awarded the 2013 Rochester Vaccine Fellowship award. Selection for the fellowship was a unanimous decision by three independent reviewers who praised Milan for his outstanding achievement in vaccine-related research. Tim R. Mosmann, Ph.D., Director of the David H. Smith Center for Vaccine Biology and Immunology at the University of Rochester Medical Center, was awarded the 2013 Novartis Prize for Basic Immunology. He shares the prize, which is awarded every three years for breakthrough contributions to the fields of basic and clinical immunology, with Robert L. Coffman, Ph.D., Vice President and Chief Scientific Officer at Dynavax. The prize was awarded for Mosmann and Coffman’s research on how the body responds to different invaders, for example, bacteria versus parasitic worms. In the early 1980’s, they zeroed in on a group of white blood cells called helper T cells or TH cells, which communicate with other cells to activate the immune system and wipe out intruders. They discovered that TH cells fall into two distinct groups: TH1 cells, designed to eliminate bacteria and viruses; and TH2 cells, which are more effective against extracellular organisms, like worms and other parasites. When Tim started this research, scientists thought that helper T cells could be divided into at least two subgroups, but no one had been able to prove this, said Stephen Dewhurst, Ph.D., chair of the Department of Microbiology and Immunology at the Medical Center. Tim elegantly showed that these cells could be divided into two subsets that produced different secreted proteins (cytokines) and that had different functions – a finding that profoundly changed the way people think about the immune system. Five diverse research projects at the University were selected as recipients of the sixth annual Provost’s Multidisciplinary Awards. The initiative provides $250,000 each year to support faculty research that crosses disciplines. Among the recipients were Microbiology and CVBI associate professor, Deborah Fowell, in collaboration with Jane Sottile (Medicine, Aab Cardiovascular Research Institute) for their project entitled, Extracellular Matrix Composition As A Critical Regulator of The Immune Response. Tara Capece, a CVBI student in Minsoo Kim lab, won Second Place at the Graduate Student Society Poster Competition in recognition of outstanding presentation of thesis work The competition was held in the Sarah Flaum Atrium in April and involved students from all graduate programs at the University of Rochester Medical Center. Congratulations Tara! The World Intellectual Property Organization (Wipo) has published a patent entitled, Photoactivatable Receptors and Their Uses by CVBI associate professor Minsoo Kim. The patent abstract states, Provided herein is a chimeric photoactivatable polypeptide comprising an opsin membrane receptor, wherein an intracellular domain of the opsin membrane receptor is replaced with a corresponding intracellular domain of a chemokine receptor, a sphingosine-1-phosphate receptor or an ATP receptor and uses thereof. Further provided are methods of treating cancer, injury of the nervous system, autoimmune disease, and graft rejection comprising administering to the subject a cell that expresses the chimeric photoactivatable polypeptide and exposing the cell to a visible light source. Paul L. LaCelle, M.D., a University of Rochester Medical Center faculty member for more than 40 years, a former department chair and former senior dean, died March 9. He was 82. Dr. LaCelle, a 1959 graduate of the University's School of Medicine and Dentistry, joined the faculty in 1964 as an instructor of what was then the Department of Radiation Biology and Biophysics. He was named a professor in 1974 and chaired what is now the Department of Biochemistry and Biophysics from 1977 to 1996. Scientists have taken a remarkably detailed look at the initial steps that occur in the body when type 1 diabetes mellitus first develops in a child or young adult. The analysis comes from a team of researchers and physicians at the University of Rochester Medical Center who have expertise both in the laboratory and in treating patients. The team studied children from ages 8 to 18 within 48 hours of their diagnosis with type 1 diabetes, an autoimmune disease where the body’s immune system attacks the cells in the pancreas that make insulin. The trend is noticeable to pediatrician Nicholas Jospe, M.D., chief of Pediatric Endocrinology at Golisano Children's Hospital of the University of Rochester Medical Center, and his colleagues nationwide. His group now sees about 90 new cases of type 1 diabetes per year, compared to approximately 25 annually 20 years ago. system responds to the influenza virus. The University of Rochester Medical Center has been awarded $4.7 million from the Federal government, with several options for additional funding, to establish a center to study the germs that cause lung disease. The agreement with the National Institute of Allergy and Infectious Diseases (NIAID), part of the National Institutes of Health, took effect earlier this month. The agreement, renewable on a year-by-year basis, could last potentially for seven years. If the agreement lasts the full seven years, contract funding may be at least $35 million, and support could reach as much as $50 million, if NIAID exercises all its options. Creation of the new center was led by microbiologist David Topham, Ph.D., an influenza researcher who also directs the Health Sciences Center for Computational Innovation. Tim Mosmann, Ph.D., director of the David H. Smith Center for Vaccine Biology and Immunology at the Medical Center presented at a 2011 independently organized TEDx Rochester event. Dr. Mosmann's talk starts by explaining the complexity behind the immune system. Then goes on to tell how we're being overwhelmed by new data on that subject and how best to handle that overload. While most people think of dogs, raccoons or skunks as potential rabies carriers, bats are a major source of the disease in the United States, experts say. And on Thursday, the Centers for Disease Control and Prevention announced that a Mexican teenager had become the first person on U.S. soil to die from rabies after getting bit by a vampire bat. Experts say that as soon as exposure to a rabid animal is suspected, it's important to consult a doctor and receive a post-exposure prophylaxis vaccine. The vaccine will prevent them from getting rabies, which is almost always fatal. Because the rabies virus takes weeks to incubate, there is time for the vaccine to prevent disease even when given after exposure to the virus, said Dr. David Topham, associate professor of microbiology and immunology at University of Rochester Medical Center. The man's death could have been easily prevented if he'd sought treatment in time. David Topham, Ph.D. stands next to an IBM supercomputer. Since 2005, UR has experienced a 31 percent increase in research funds, culminating in the $461 million received for the fiscal year that ended last June, while the number of UR employees rose by almost 20 percent to just under 20,000. But the spillover of research to startups has been less pronounced. UR is now licensing the know-how from its research to 31 local companies that, as of about a year ago, employed 346 workers. Both UR and RIT are trying to increase their economic presence locally. UR is teaming up with IBM to establish a $100 million high-powered computer center that will provide unique research capabilities in health-related sciences, while RIT is establishing itself as a leader in promoting cost savings in green technology and industrial sustainability. In his office at UR's School of Medicine and Dentistry, David Topham, Ph.D. who is vice provost and executive director of Health Sciences Center for Computational Innovation, can pull up on his computer screen an image of two proteins interacting with a virus. You need the supercomputer to handle the amounts of data required for this sort of simulation, said Topham, explaining how this high-powered computer is helping researchers trying to design a vaccine against a range of viruses. As any weekend warrior knows, an errant elbow or a missed ball can put a crimp in an afternoon of fun. The bruising and swelling are painfully obvious, but the processes occurring under the skin remain full of mystery. What is known is that leukocytes, or white blood cells, mobilize to protect injured body tissue from infection. What is not understood is why some leukocytes - but not others - are attracted to damaged tissue. The response begins when leukocytes travel through blood vessels near the site of the injury and stop. Eight out of ten white blood cells will eventually continue traveling through the blood vessel, while the other two cells will actually enter the tissue to begin fighting against infection. Thanks to a $9.2 million grant from the National Institutes of Health, a research team led by Richard Waugh (Waugh Lab), Chairman of the Biomedical Engineering Department at the University of Rochester, is trying to find the reasons. The project team includes: Minsoo Kim(Kim Lab) and Ingrid Sarelius of the University of Rochester; Michael King and Moonsoo Jin of Cornell University; Daniel Hammer of the University of Pennsylvania; and Micah Dembo of Boston University. Golisano Children's Hospital at the University of Rochester Medical Center (URMC) has been awarded a five-year grant for nearly $2 million by the National Institutes of Health, as part of the Child Health Research Centers program. The program, aimed at establishing and growing centers of excellence in pediatric research, will fund basic science training for junior faculty members in pediatric subspecialty areas. One scholar in particular that will enroll in the program during its first year is Kristin M. Scheible, M.D., Senior Instructor in Neonatology and Pediatrics and current member of Dr. David Topham's lab. The enrolled junior investigators will spend 75 percent of their time conducting research in their specialty areas. The program will help them cultivate research within their area of expertise, develop analytical and practical skills to understand and treat developmental diseases in children and establish themselves as ethically and scientifically sound clinical researchers. Rochester has a long-standing clinical infrastructure and an outstanding track record in vaccine research. Now, we are building on this expertise, taking vaccine research into the twenty-first century by applying mathematical and computational approaches, said David Topham, Ph.D., co-director of the New York Influenza Center of Excellence (NYICE) and an expert on how the body fights the flu. There is also tremendous collaboration and cross pollination among researchers and between programs – another reason why we are able to conduct complicated clinical studies that many other universities would have a hard time doing. Nearly 200 researchers from around the world have convened in Rochester this week to discuss new insights into flu. The meeting is the fourth annual for the National Institutes of Health's Centers of Excellence for Influenza Research and Surveillance (CEIRS) consortium. This is the first meeting to be hosted by URMC, whose New York Influenza Center of Excellence (NYICE) was established in 2007 thanks to a seven-year, $26 million NIH contract. The NIH has charged its CEIRS centers with the twin goals of helping make seasonal influenza and future influenza pandemics less deadly, said John Treanor, M.D., chief of URMC's Infectious Disease Division. Treanor co-directs URMC's center together with David Topham, Ph.D., an associate professor of Microbiology and Immunology. People think we know more about the flu than we actually do, said Topham. It's amazing how little we actually understand. Meetings like this are a critical venue for exchanging insights that grow our body of knowledge. A half million dollars in federal stimulus funds bought high-tech filtration and decontamination equipment to safely conduct bird flu virus experiments involving mice at University of Rochester Medical Center. This will enhance the university's ability to remain competitive in attracting research funding and conducting important health-related research, said David Topham, Ph.D., a URMC researcher and co-director of the New York Influenza Center of Excellence (NYICE) at URMC. The equipment allows testing the effectiveness of bird flu vaccines, including testing vaccinated mice. Scientists have uncovered the flu's secret formula for effectively evolving within and between host species: balance. The key lies with the flu's unique replication process, which has evolved to produce enough mutations for the virus to spread and adapt to its host environment. These new findings give us insights into how we may be able to control viral evolution, said Baek Kim, Ph.D., professor in the department of Microbiology and Immunology at the University of Rochester Medical Center and lead study author. The perception has always been that the flu virus mutates a lot, and in order to do that it has to have an enzyme that makes a lot of mistakes, but Kim's work shows that is not the case at all, said David Topham, Ph.D., associate professor of Microbiology and Immunology at Rochester and an expert on how the body fights the flu. A new Japanese study outlines the molecular and cellular reasons why some flu vaccines work better than others and could point the way to better protection with fewer side effects. Split-virus flu vaccines are used in the United States. The study found that whole-virus vaccines provoke a greater immune response, which has both a good and a bad side, said David Topham, Ph.D., a flu virus expert who is an associate professor of Microbiology and Immunology at the University of Rochester in New York. The whole-virus vaccine is reactogenic, meaning that it can cause pain at the site of injection and other side effects, Topham said. The slightly lower immune response produced by a split-virus vaccine is offset by a reduction in side effects, he explained. After nearly a year of headlines, worry and confusion, the H1N1 swine flu virus is now out of the news. Is it out of circulation as well? The latest data from the U.S. Centers for Disease Control and Prevention finds no states reporting widespread influenza activity and only five reporting regional activity. It certainly seems to have died down in this country. It's gone very quiet, confirmed David Topham, co-director of the New York Influenza Center of Excellence and associate professor of Microbiology and Immunology at the University of Rochester Medical Center. Topham went on to say, I'm pretty confident that this virus is here to stay with us. It will become one of the seasonal influenzas we'll have to contend with, he said. Microbiologist David Topham, Ph.D. discussed his work on flu and the current pandemic at 4 p.m. on Friday, Nov. 13, in the Class of '62 Auditorium (Room G-9425) at the Medical Center. The talk, part of the Second Friday Science Social lecture series, is geared mainly to faculty, staff and students at the University, though the general public is welcome as well. Topham is an expert on how the body fights the flu, and he helps to direct a research center that is part of a key Federal network designed to fight the flu. He's busy directing studies aimed at understanding the current pandemic and preventing future ones, as well as studying infected people to learn how the body fights the flu. With flu vaccination season in full swing, research from the University of Rochester Medical Center cautions that use of many common pain killers - Advil, Tylenol, aspirin - at the time of injection may blunt the effect of the shot and have a negative effect on the immune system. Richard P. Phipps, Ph.D., professor of Environmental Medicine, Microbiology and Immunology, and of Pediatrics, has been studying this issue for years and recently presented his latest findings at the Bioactive Lipids in Cancer, Inflammation and Related Diseases Conference. URMC co-investigators on the study in Cellular Immunology include: David Topham, Ph.D., an expert in the immune response to influenza and a principal investigator in the David H. Smith Center for Vaccine Biology and Immunology, and Simona Bancos and Matthew P. Bernard, of the Department of Environmental Medicine's Lung Biology and Disease Program. The discovery of three cases of the pandemic H1N1 influenza that are resistant to a key antiviral drug is not surprising, experts say. What is worrying some is that one of the cases of resistance to oseltamivir (Tamiflu) occurred in a woman in Hong Kong who had not been treated with the drug. But until these cases emerged, there had been no sign of oseltamivir resistance in the pandemic H1N1 flu. Keiji Fukuda, M.D., of the World Health Organization, said there is still no evidence that a resistant strain is being transmitted. That said, the emergence of drug-resistant viruses is not unexpected, according to David Topham, Ph.D., of the University of Rochester in Rochester, N.Y., especially in light of the increased use of influenza antivirals in the context of this recent pandemic. Researchers have successfully tested for the first time a computer simulation of major portions of the body’s immune reaction to influenza type A, with implications for treatment design and preparation ahead of future pandemics, according to work accepted for publication, and posted online, by the Journal of Virology. The new “global” flu model is built out of preexisting, smaller-scale models that capture in mathematical equations millions of simulated interactions between virtual immune cells and viruses. Earlier this month, the University of Rochester Medical Center again became one of only nine institutions nationwide to receive a new wave of National Institutes of Health dollars designed to pave inroads into unraveling – and treating – autoimmune diseases. In 2003, a similar endeavor to establish nine “Autoimmunity Centers of Excellence” (or ACEs) – which would supercharge research into conditions like lupus, diabetes (type 1), multiple sclerosis and some types of arthritis – also targeted URMC. Together with Duke University and the University of California, San Francisco, Rochester’s is among only three of the original ACEs to be refunded, receiving at least $5 million over the next five years, and possibly more if supplementary money is awarded for additional trials. Historically, URMC has been a powerful player in the field of immunology, with researchers knee-deep in deciphering the inner workings of the immune system, and in hot pursuit of new ways to manufacture vaccines. But according to Ignacio Sanz, M.D., chief of the division of Allergy/Immunology & Rheumatology at URMC, and also principal investigator for URMC’s ACE, it’s also possible the broad-reaching nature of the proposed projects was a key factor in the Rochester center’s renewal. Current strategies for designing vaccines against HIV and cancers, for instance, may enable some components in multi-component vaccines to cancel the effect of others on the immune system, eliminating their ability to provide protection, according to an article to be published shortly in the Proceedings of the National Academy of Sciences (PNAS). The authors also successfully tested techniques that offer a solution to newly revealed mechanisms that enable some vaccine components to outcompete others. Andrea Sant, Ph.D., professor within the David H. Smith Center for Vaccine Biology and Immunology at the University of Rochester Medical Center, published a July 2005 article in the journal Immunity which revealed the quality that confers immunodominance on a peptide to be the strength and lifespan (kinetic stability) of its bond to the MHC class II protein. Kinetic stability determines whether, in the face of competing reactions, a peptide:MHC class II complex can accumulate at the surface of the dendritic cell, and then remain intact long enough to sustain T cell expansion. Dr. Sant’s team found that immunodominant peptides held onto to MHC molecules ten to one hundred times longer than nondominant, or “cryptic,” peptides because they fit together better. In the years since, Sant and colleagues have determined how the kinetic stability of the MHC:peptide bond has its effect. As the death toll from swine flu in Mexico rises and new cases appear in the United States and elsewhere, it's easy to get caught up in a sense of mounting dread. But experts in influenza and infectious disease say the exact level of danger from the virus is still far from certain. This is something of concern [but] I think we should hold back on calling it a real threat, said David Topham, co-director of the New York Influenza Center of Excellence, part of the University of Rochester Medical Center. We always have to take these things seriously, but we have a very good system in place to respond. In February, a group of experimental ferrets at a research facility in the Czech Republic fell ill. The ferrets had recently been injected with a culture containing what was believed to be a straight shot of the seasonal influenza virus, but their symptoms were severe and wholly unexpected. Researchers later determined that they were suffering from avian influenza; the seasonal flu culture had been contaminated with the deadly virus H5N1. I think it points to major problems, says David Topham, Ph.D., a microbiologist at the University of Rochester Medical Center and co-director of the New York Influenza Center of Excellence. Although contamination can happen easily, he says, there should be sufficient safety measures in place to prevent it. Bolstered by a five-year, $1.9 million research grant from the National Institutes of Health, Jennifer Anolik, M.D., Ph.D., assistant professor of Medicine and of Pathology and Laboratory Medicine, plans to probe why certain targeted therapies prove effective for some lupus patients, but not others. Working with Anolik on the study are Jane Liesveld, M.D., professor of Medicine and professor at the James P. Wilmot Cancer Center; Deborah Fowell, Ph.D., associate professor of Microbiology and Immunology; and Frances Lund, Ph.D., professor of Medicine in the Division of Allergy/Immunology and Rheumatology. Researchers have found a way to selectively block the ability of white blood cells to crawl toward the sites of injury and infection when such mobility drives disease, according to a study published today in The Journal of Experimental Medicine. The results suggest a new treatment approach for autoimmune diseases like rheumatoid arthritis, lupus and multiple sclerosis, and for conditions made worse by misplaced inflammation, like atherosclerosis, stroke and transplant rejection, researchers said. There are many cases where it would be incredibly useful to precisely block integrin activation, and thus T cell migration, said Minsoo Kim, Ph.D., assistant professor of Microbiology and Immunology within the David H. Smith Center for Vaccine Biology and Immunology at the Medical Center, and lead author of the article. Good examples include when our immune system attacks our own cells, or rejects a lifesaving transplant or clogs our blood vessels by mistake. The problem is that past, system-wide attempts that block all integrin activation, like the multiple sclerosis drug Tysabri, shut down not only unwanted inflammation in one locale, but also vital immune defenses elsewhere, leaving patients vulnerable to infection. A researcher at the University of Rochester Medical Center has won the 2008 Paul Ehrlich and Ludwig Darmstaedter Prize for his contribution to the field of immunology. The prize, which includes with a cash award of 100,000 euros, has been awarded to Tim Mosmann, Ph.D., director of the David H. Smith Center for Vaccine Biology and Immunology at the Medical Center. The Scientific Council of the Paul Ehrlich Foundation, a German organization gives the award each year to recognize achievement in Ehrlich's fields: immunology, oncology, haematology and microbiology. 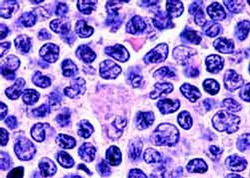 Mantle cell lymphoma as seen under a microscope. A James P. Wilmot Cancer Center scientist recently received two research grants, totaling more than $1.5 million, for separate, divergent studies of new therapies for follicular and mantle cell lymphomas. In the first Lymphoma Research Foundation-funded project, Steven Bernstein, M.D., co-director of Wilmot's Lymphoma Biology Program at the University of Rochester Medical Center, will investigate whether rituximab, an antibody treatment for follicular lymphoma, causes the body's immune response to fight the disease. Rituximab, also known as Rituxan, is effective in treating the disease, but how it actually works remains unclear to scientists and oncologists. Bernstein's team, which includes immunologists Shannon Hilchey, Ph.D., Tim Mosmann, Ph.D., and Alexandra Livingstone, Ph.D., will examine whether rituximab therapy generates an immune response specifically targeting the lymphoma cells. Last week, NIH announced that it would fund six Centers nationally to study the flu. Under the leadership of Drs. John Treanor and David Topham, and with the expertise of a large number of faculty co-investigators, Rochester will be one of these Centers. Over the next seven years, we will receive $26 million to conduct studies that will improve our understanding of the biology of the virus and of our immune response to influenza viruses and vaccines. Could the Ability to Expel Worms Lead to a Future Asthma Treatment? Based on experiments with worms similar to those that infest millions of children in the tropics, researchers see potential for a new way to treat asthma. Parasitic infections and asthma may cause the human immune system to react in some of the same ways, and may one day be cured by manipulating some of the same proteins, according to research published today in the journal Science. To be effective, the immune system must decide which cells and chemicals need to be ramped up to best destroy the invader at hand, be it bacterium, virus or worm. In 1986, Tim Mosmann, Ph.D., now director of the David H. Smith Center for Vaccine Biology and Immunology at the University of Rochester Medical Center, led a team that first described a new concept for how the immune system might make such choices: the Th1/Th2 Model. Read More: Could the Ability to Expel Worms Lead to a Future Asthma Treatment? Three researchers at the University of Rochester Medical Center have been chosen to receive research awards from Johnson & Johnson based on the potential of their work to lead to medical breakthroughs. The awards, announced today, represent the second round from the “Discovery Concept Fund,” an academic-industry partnership launched in 2005. The fund is designed to nurture early-stage research by scientists who have promising ideas, but not ready access to research funding for a given project. Combined with the first round of awards given out in January 2006, the new funding brings J&J’s total investment in Medical Center research this year to $400,000. The second round award-winners were Deborah Fowell, Ph.D., assistant professor of Microbiology & Immunology; Ian Nicholas Crispe, Ph.D., associate director of the David H. Smith Center for Vaccine Biology and Immunology; and Andrei Yakovlev, Ph.D., chair of the Department of Biostatistics and Computational Biology. With support from the award, Fowell is researching new ways to harness the body’s natural regulatory lymphocytes to hold the immune system in check. Her work with regulatory T cells could lead to new drugs that either damp down the immune system when it mistakes our own cells for foreign invaders (e.g. autoimmune diseases) or pump up the immune system’s attack on disease-related molecules that have fooled our system into passing them by (e.g. tumors and chronic infection). Immunologist Tim Mosmann, Ph.D., will discuss the immune system – the assortment of defenses that keep our bodies from being overrun by an ever-adapting array of microbes, viruses, parasites, and other threats – as part of a lecture series highlighting biological and biomedical research at the University of Rochester. Mosmann will discuss his work on the immune system at 4 p.m. Friday, Aug. 11, in the Case Methods Room (Room 1-9576) at the Medical Center. It’s the latest installment of the Second Friday Science Social lecture series geared mainly to faculty, staff and students at the University, though the general public is welcome as well. The lectures are free. More information. Bird Flu Vaccine: Will It Work? GlaxoSmithKline's bird flu vaccine contains a new type of adjuvant, or compound, that boosts the body's immune response. The U.S. Food and Drug Administration has hesitated to approve adjuvants, said David Topham, a microbiology professor at the University of Rochester, as they can cause side effects such as swelling and tenderness. You don’t want to put anything in a healthy person that can cause a problem, Topham said. Read More: Bird Flu Vaccine: Will It Work? A new research center whose scientists are working on better ways to treat multiple sclerosis has been established in Rochester by the National Multiple Sclerosis Society. The University of Rochester Medical Center is bringing together experts who normally focus on Alzheimer’s disease, HIV vaccines, and spinal cord repair, as well as multiple sclerosis, in a unique center designed to stimulate MS research by drawing on the expertise of scientists from a wide array of disciplines. The new Collaborative Multiple Sclerosis Research Center Award – the only one in the nation established by the society this year – is headed by neurologist Benjamin Segal, M.D., associate professor of Neurology and director of Neuroimmunology Research. Segal has enlisted several of his colleagues to direct their attention on new ways to investigate the disease. Also taking part in the project are neurologists Steven Schwid, M.D., and Andrew Goodman, M.D., who have extensive experience with clinical trials in MS; and Howard Federoff, M.D., Ph.D., and Tim Mosmann, Ph.D., who head research centers in aging and in vaccine biology, respectively. What stops the bird flu? Viruses infect cells by latching on to receptor molecules on the cell surface. 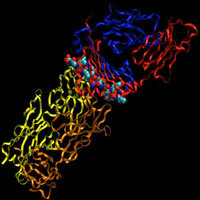 Flu viruses bind to sialic acid (SA) receptors. Most H5N1 viruses - there are now many strains - need a receptor in the alpha2,3Gal configuration. In humans, only deep lung cells carry that SA configuration. Nose, throat, and sinus cells have SA in the alpha2,6Gal configuration. If that doesn't sound very different, it isn't. It would only take a few small mutations for the bird flu virus to be able to latch on to human cells. Flu expert David Topham, Ph.D., of the University of Rochester, N.Y., says this part of the flu virus mutates rapidly. It is relatively easy for the bird flu virus to accommodate such a thing, Topham tells WebMD. And when people get the infection deep in the lung, there would be selective pressure on the virus to acquire this mutation. So this adaptation to humans might not have to happen in another species. It might occur in humans. Noelle Polakos, a 5th year graduate student in Dr. David Topham's lab received a travel and conference award from GWIS. She attended and presented a poster at the Keystone Meeting on Viral Immunity and Advances in Influenza Research in Steamboat Springs, Colorado. In an effort to deny diseases the ability to hide, researchers have for years been asking a key question: Why do our bodies select certain, small pieces (epitopes) of each disease-causing molecule to trigger an immune response, while ignoring the rest? Those few, triggering protein fragments are termed "immunodominant." Unfortunately, the immune system sometimes makes poor choices about which epitopes to pay attention to, and which to ignore. Understanding of how immunodominance is conferred would enable vaccine designers to shift the immune system spotlight to parts of pathogens that they cannot change in efforts to escape detection. For example, a vaccine could be designed to target a protein fragment central to a virus’s ability to reproduce, or to invade its prey. "Our study identified for the first time the chemical mechanism that determines immunodominance, and proved that it can be fine-tuned," said Andrea Sant, Ph.D., a professor within the David H. Smith Center for Vaccine Biology and Immunology at the University of Rochester Medical Center, and the study’s lead author. "If confirmed, the findings could launch a new wing of research seeking to re-engineer viruses, bacteria and tumor cells to make them hundreds of times more likely to be noticed and destroyed by our immune system." A vaccine to prevent a type of cancer that kills more than 250,000 women around the globe every year is expected to become available within a year or two, thanks in large part to technology developed by scientists at the University of Rochester Medical Center. Vaccines that prevent cervical cancer are in the final stages of testing in studies by two companies, Merck and Co. and GlaxoSmithKline (GSK). Earlier this month the two pharmaceutical giants agreed on a settlement involving patents and royalties related to the vaccines, clearing the way for continued development of their products. The vaccine targets a group of viruses known as human papillomaviruses (HPV), which cause 12,000 cases of cervical cancer in women in the United States annually. About 4,500 women in the nation die of the disease every year. The toll is much worse in other parts of the world, where Pap smears to detect the disease in its earliest stages are not widely available. In some parts of the world, cervical cancer is the leading cause of death by cancer in women. "The public health impact of this work – which has the potential to prevent a condition that causes significant morbidity and mortality in women – is enormous, both nationally and internationally," says David Guzick, M.D., Ph.D., dean of the School of Medicine and Dentistry and professor of Obstetrics and Gynecology. Researchers at the University of Rochester have identified a protein in the immune system that appears to play a crucial role in protecting against deadly forms of influenza, and may be particularly important in protecting against emerging flu viruses like the avian flu. The researchers believe that a vaccine made with a live but weakened strain of flu virus - such as the inhaled flu vaccine introduced last year - may activate this part of the immune system and offer the best defense against avian flu. The findings demonstrate that when confronted by a potentially deadly flu strain, an effective first strike by T cells in the lungs can mean the difference between life and death. To immunologist David Topham, Ph.D., assistant professor of Microbiology and Immunology at the University of Rochester and lead author of the study, the findings reveal something else: a shortcoming in the world’s most widely administered flu vaccines. Rochester doctors and nurses have been chosen to lead the largest study of smallpox vaccine to date, a nationwide study of approximately 900 patients that will be conducted at seven sites around the country, including Rochester. Approximately 200 people in the Rochester area who were vaccinated against the disease as children will receive a booster shot as part of the study. John Treanor, M.D., associate professor of medicine and director of the medical center's Vaccine and Treatment Evaluation Unit, will lead the national study, coordinating doctors at all seven sites and guiding the effort to evaluate the results. Besides Treanor, scientists involved in this study are immunologists David Topham, Ph.D., and Tim Mosmann, Ph.D., of the David H. Smith Center for Vaccine Biology and Immunology; and molecular biologist Mark Sullivan, Ph.D., of the Center for Human Genetics and Molecular Pediatric Disease.